Doing a Windows backup is one of the smartest things you can do to protect the important information, photos, music and critical data on your computer. Your hard drive is going to crash – it is just a question of when. 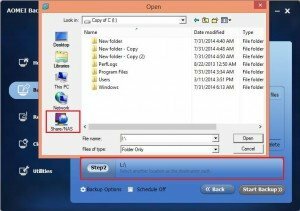 So, it is necessary to back up windows computer. You can easily copy all your files to a CD or another computer on your home network. Also, keep all your original Windows and program installation CDs in a safe place. But question is where you should back up your windows computer? Internal hard drives? External hard drives? Writeable CDs or DVDs? USB flash drives? Or network hard drive? Actually, every destination type where you can back up has its feature which contains advantages and disadvantages. You have to consider some factors such as environment, what you back up, and so on. It benefits unified management. For enterprise, every staff can commit system to server, and share it with others. They need not to prepare one or more external hard drive. It can save time and money. In the process of backing up, you don’t install external hard drive, and pass files by it. It will save half time to read and write. It saves your storage volume in internal hard drive. Because windows computer will be backed up to another computer, it doesn’t require more storage space in your computer. Anytime to Restore. Only two computers are on LAN, you can restore window computer from another computer without installing other drives. You can use computer to back up windows computer to network hard drive with the function equipped by Microsoft, but it is too complex to operate for amateur. But you can do it with AOMEI backupper standard Edition, which is not only free charge, but also can back up your system to another computer. The instruction below can guide you to operate easily. Click “System Backup” in the interface. 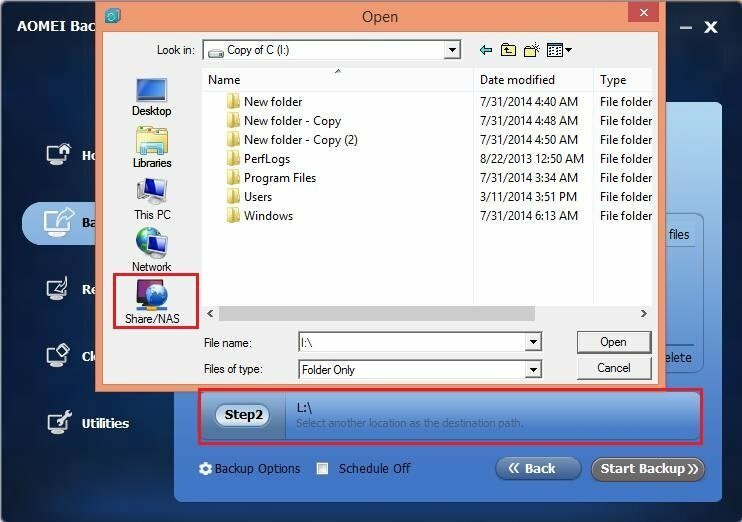 In step 2, you have to click “NAS” in the left wizard to back up your system to another computer. Click “Add share or NAS device”, and a pop-up windows will appear. You have to type IP address of another compute where you want to back up. If that computer has username and password, you have to input it. After steps above are finished, you can click OK, and the process of backup will be finish automatically.